This promotional poster for the drama series "Sky Castle" was provided by JTBC. The supporting role of a shameless villain in an adulterous relationship that Kim Seo-hyung played in SBS' 2009 hit drama series "Temptation of Wife" brought her out of more than 10 years of obscurity. Since then, many more villain roles have come her way, including her cameo role in the 2018 drama series by MBC "Come and Hug Me," fixing her image on the small screen as a cold-blooded, merciless woman. 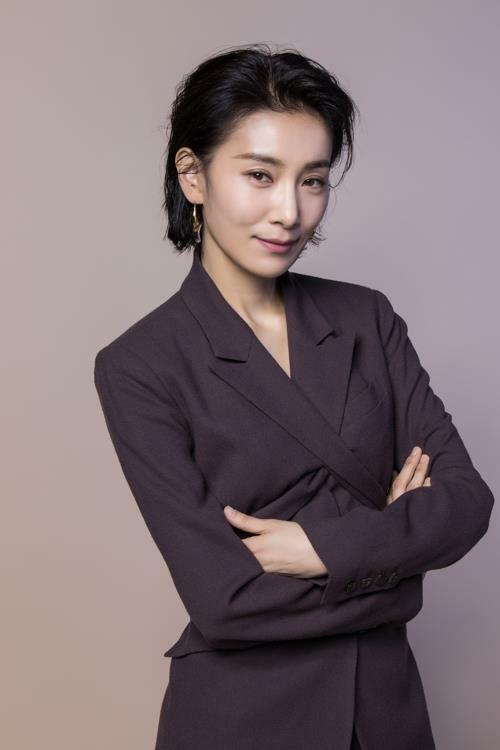 Her latest role in "Sky Castle," a black comedy and thriller by the cable channel JTBC whose final episode is set to air on Friday, has brought her villainous career to the next level. This photo of Kim Seo-hyung was provided by Fly Up Entertainment. Kim plays Kim Joo-young, a miserable professional coordinator for college admissions who manipulates and eventually destroys rich, high-class parents in a deal with the devil to get their children admitted to the country's top medical school. Sky Castle is the name of the luxurious residential compound where Kim's clients live. "At first, I thought I cannot do this, so I wanted to quit and run away," the 46-year-old actress said in a media interview on Tuesday, referring to the imposing challenge the latest role posed to her. "I really did not want to create another Shin Ae-ri," Kim said, recalling her career-making role in the 2009 drama series. "I hate repeating (what I have done already). I really hate what was seen already being seen again." "The Shin Ae-ri character in 'Temptation of Wife' made me what I am now, but at the same time, it also traumatized me," Kim said. "The habits of Kim Seo-hyung as an actress, such as characters and voice, constantly seeped into Kim Joo-young, so I felt I could not do it. It was the first time I wanted to run away (in the middle of a series)," she said. Eventually, she made it to the end of the 20 episodes, immaculately and chillingly personifying the character who, having destroyed her own genius child with her desire for academic excellence, seeks revenge to bring down parents like her. The drama series laid bare the cruelty and inhumanity of the country's blind competition to go to prestigious universities, resonating widely with the audience. It also made TV drama series history, garnering a record-high viewer rating of 22.3 percent for a drama series aired by cable channels, according to Nielsen Korea. The previous record was held by "Guardian: The Lonely and Great God," a fantasy romance by tvN that aired from 2016-2017 and had a viewer rating of 20.5 percent at its peak. "Sky Castle" was so famous, even from its first episode, that the script of one of the episodes was leaked ahead of its broadcasting, leading the production team to file for a police investigation into the public leak. With the sensational success of the JTBC program, every actor and actress in the show stormed into the public consciousness, led by Kim, whose steely facial expressions, fashion style and speech created a flurry of parodies on the small screen and on the Internet. "I never, ever dreamed that I would have another heyday after 10 years," she said, attributing the success to her previous villain roles. "The villain characters I played, including Shin Ae-ri, were, in fact, not steel-willed roles but rather pathetic characters," she said. "I cried a lot while playing the role of Kim Joo-young, (because) it made me wonder, 'Why do I have to always play poor roles that make me lonely?'" Kim also recalled the painstaking behind-the-scene efforts she made to bring to life her "Sky Castle" character. "Every week, I had scenes for two or three episodes, and it took me nearly four hours to try on costumes for the episodes," Kim said. The style of her hair, all tightly pulled back in a bun, was a major source of pain throughout all the episodes. "The frustration and rage from the headaches in the initial part of the series were beyond verbal expression," she said, adding that the pain caused her to regret her part at some points. The massive pressure also put her on an emotional edge all throughout the shooting, barring any solid communication with actor Lee Hyun-jin, who played the role of a faithful assistant. "The two lonely characters managed to pull through the show very well," she said with tearful eyes. "We could take our first smiling photo together only when the shooting reached the final 19th and 20th episodes."